I wasn’t too hopeful of the Galaxy S8+ giving me good battery life when I started using the phone. I knew the 3,500 mAh battery inside the Galaxy S8+ was capable of lasting a day, but for the first time, I decided to use a Samsung flagship with two SIM cards, and that was something that hadn’t worked out great when I had tried it with the Galaxy S7 edge last year. But I have to say the Galaxy S8+ has me impressed with its battery life figures, especially with Always On Display enabled along with two SIM cards. The other day, my S8+ managed to offer a screen time of nearly 3 hours and a total running time of 1 day and 4 hours, with 7 percent charge remaining. That screen time might not sound like much, and I hadn’t used the phone too heavily over the day. But when you take into consideration that the phone had to stay connected to two mobile networks and keep Always On Display running, that kind of endurance manages to impress. Whether it’s the new dedicated chip for AOD, the 10 nm Exynos chipset, software optimization, or all of those combined, the S8+ doesn’t disappoint, even if the battery life on Samsung’s flagships continues to be a far cry from what its mid-range phones can manage. In fact, other than a couple of days where I’ve been on LTE data for a significant part of the day, I’ve not encountered any scenario where my S8+ needed to be charged to get by without worry. I’m sure those moments will present themselves in the future, but right now, my S8+ is doing a great job at keeping me company both on workdays and on weekends. If Samsung is to be believed, the S8+ (and S8) will retain 95 percent of its charge capacity after a year, so one can further hope the impressive battery endurance of the S8+ will continue to be a thing when the Galaxy S9 goes official. I’ll be removing a SIM from my S8+ to see how battery life improves with a single SIM inside (and also testing it with AOD turned off) and sharing my results in the coming weeks. Have you been using your Galaxy S8 or S8+ with two SIM cards? 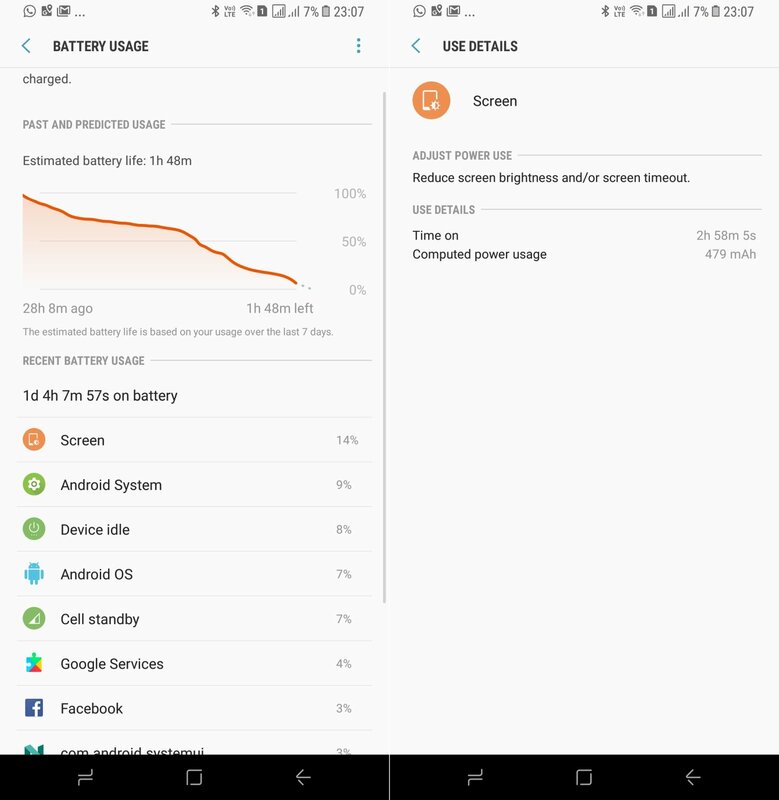 How has your experience been with the phone’s battery life? Let us know in the comments! If i did 3h sot with that phone , i throw away, almost a 1000€ to do 3h. And i think s7edge when new out of the box, last more. I have normal s8 and always on 4G Bluetooth and receiving 4emails ,and do around 6h in 18h standby. Maybe it need a little optimisation that s8+. The carrier networks need optimization, not the phone, haha. Indian networks are particularly worse, you won’t find anyone with an S7 edge going over 5 hours of screen time too often here, while folks in other markets get much higher endurance. Which makes the S8+ especially impressive here in India with this kind of battery life (the S8 offers much less, as expected). I use 2 sim cards on my S8, one for call & mes with 2G, one for 4G. I feel the battery’s life is consumed faster than when I connected to wifi. I’d try one if Samsung would just sell dual-SIM flagships in Finland. I think they’re underestimating how popular it would be. Now we basically have to choose between a good camera and dual-SIM. Great to hear I’m not the only one!